• Turn left on the pedestrian bridge. It will curve around by Spa LaQua and take you to the amusement park. Japanese baseball season is from May-September. If your hotel has a concierge, ask them to get tickets for you, because some of the online ticket-buying services charge up to $60(!!!) per transaction. • If you don’t have a hotel with a concierge (or a nice Japanese friend), check the game schedule online, then go to the ticket office at Tokyo Dome to buy tickets in person. 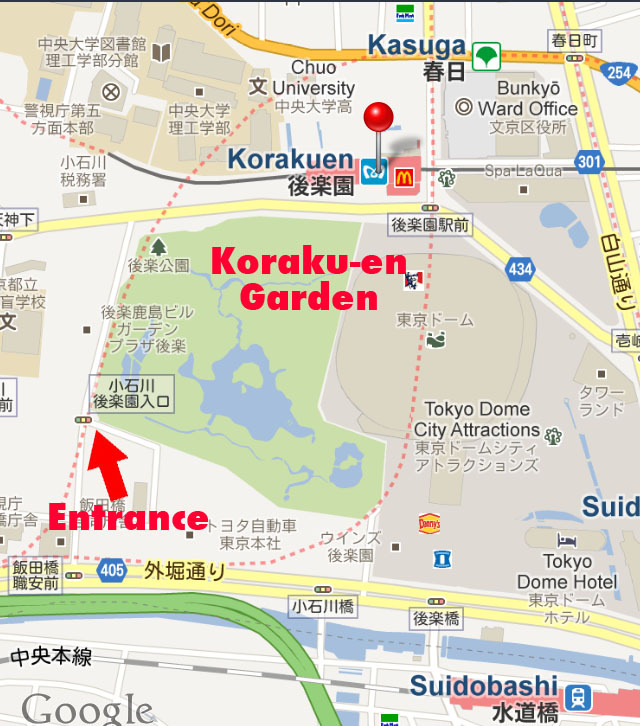 Tokyo Dome is right next to the Korakuen tran station, so it’s a pretty quick stop if you’re planning to be in that area. • Go straight out across the pedestrian bridge that crosses the street. Tokyo Dome is straight ahead. • Go out Exit 1 for Koshikawa Koraku-en garden. •Use the pedestrian overpass to cross the big street toward the Tokyo Dome and turn down the ramp to the right. You will see the big, white, garden wall on the following block straight ahead. • The entrance is, all the way around the block. Follow the white wall down the block, past the playground, and around the corner. The entrance is on the far corner of the block.